With my city digs at The Pavilion, I have to front yet another developing world problem, that is, where to eat? I am fast running out of ideas. Spasso (my review here) came to mind, but wishing to reduce my carbohydrate intake due to my lack of exercise and thus guilt for inactivities for the last couple of weeks (blame haze and heat), I reached for one of the dozen food apps I had installed on my mobile for a recommendation from strangers. Speaking of which, I am also venturing into the world of food apps development. To be more specific, I am investing into a food app start-up, a real physical company which I am very excited about. So here we are at 6:30pm, myself and one other arrived in front of service discussing of whether we should go in. The diner is basic and grubby, smelling of grease, smoke and stale ciggies. Judging from the huge bar area, one could certainly discern that alcoholic beverages is huge selling point here (like the rest of the joints clustering at the Connection Bridge in Pavilion). To help with our decision the helpful service at the front showed us the menu. We did a quick glance and went in for a punt. Walking towards our table, we passed by a couple of tourists wearing bibs (?!) eating a humongous platter of ribs, chicken, chips and corn bread served on a metal tray. This is a definite ode to obesity! The disposable placemats on the tables has recommendation options for the sharing plates, which are way too big for the 2 of us. My dining companion ordered the Smokin’ Cheese Burger. 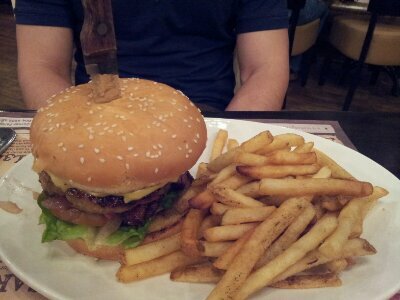 It was a huge double-patty cheese burger stabbed with a steak knife for added drama, but did not ‘wow’. Chips were edible but erred to the salty side, understandable since the diner has to up-sell drinks. It was gobbled up simply for the sake of eating. My Smokin’ Duck Salad has a dodgy Peking Duck’s influence – lettuce, cucumbers, spring onions, capsicums and strips of defrosted Peking duck sprinkled with sesame seeds. It came with sesame soy sauce on the side. 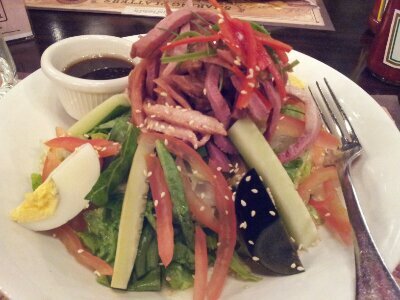 No complaints, the vegs filled me up and it was a long time I had eaten the century egg. The service rings of Malaysian hospitality – all smiles, friendly and professional. The decor was unfortunately a confused eclectic assemble of a pseudo-American diner. 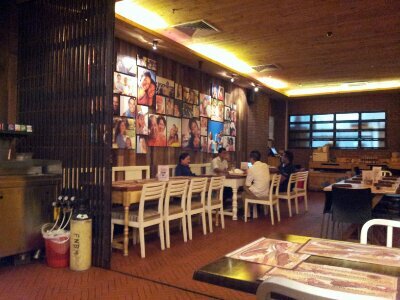 Pictures hanging on brick walls, and a juke box at a corner. There was also a TV showing Mr Bean which kept the little girl from our next table entertained. 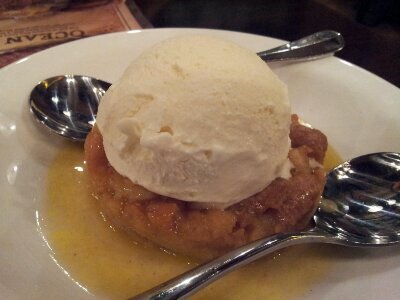 Dessert was a Bread Pudding which came with a stingy serve of ‘special’ whiskey sauce. It radiates home-made with store-bought Nestle vanilla ice-cream. Satisfied our sweet-tooth nonetheless! We did not linger long at the diner after dessert. On our way out, I noticed the couple still struggling to finish The Carnivore. 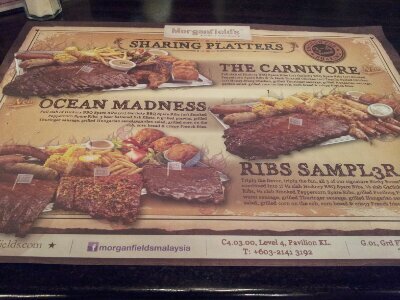 In all fairness, Morganfield’s is a ribs joint. Here I am, using my food app for recommendation from strangers, knowing full well that each person has different taste buds and what I ate was not rated nor recommended by these strangers, so I was at my own peril. It was nevertheless pretty interesting. Will I be back? Never say never, perhaps I might try the ribs one day if I can justify the carbs. This entry was posted in Kuala Lumpur, Pavilion KL, Restaurant Review and tagged Food Apps, Haze, Pavilion KL, Pseudo American Diner. Bookmark the permalink. This restaurant is owned by my brother-in-law, Ryan Poh. The new sharing plater is really good.. Can share by 4 persons! Sounds like ribs are the way to go if that is what everyone recommended. I have learned that, even though I often enjoy a good burger, burgers are often not the best when on the road. They tend to lead to disappointment! The steak knife through the burger makes for a good photo though!